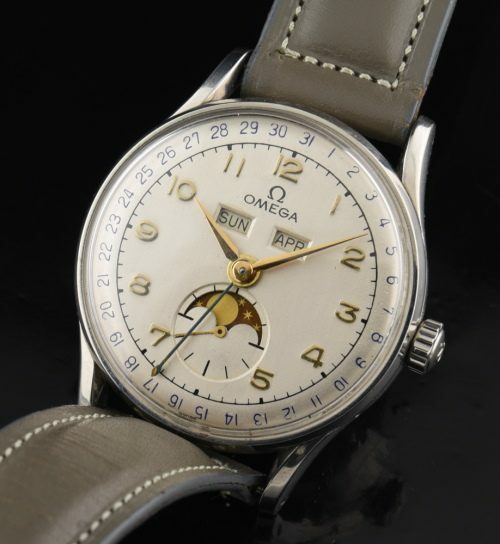 This fine OMEGA TRIPLE DATE Moonphase is known as the COSMIC, with this example produced in 1946. This stainless steel complication measures 34.5mm. The dial looks AMAZING after a professional restoration. The raised gold toned markers are original, is is the moonphase painted aperture (original paint). The Dauphine hands and date pointer are also original. This watch was just cleaned and all functions are working perfectly. DO NOT adjust the date, month etc. when the watch is set between 11-2 p.m. to avoid damage (time is ok to set). This watch even has a period, ORIGINAL OMEGA buckle, band and OMEGA box. You will love it!